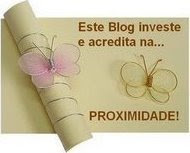 It was like never before – we had reached a new high(?!) in leaving for the airport at night to catch the 1.40 am Lufthansa flight from Chennai to Newark via Frankfurt. I have never enjoyed this travelling overseas business, the red tape unnerves me. Filling in forms is a nightmare, and at the other end I dread immigration and customs. And I always wonder why Scottie can’t be around, to beam me up. We had to wait a bit to check in, but after that it wasn’t too bad, though of course I missed the comfort of my bed where I would rather have been at that hour. Only the thought of the great pleasure waiting for us at the end of the trip kept me going. As usual I had asked for a window seat, and as usual all that I could see out of it was the wing of the plane. It never ceases to amaze me how I consistently get such window seats. Our seats had blankets and pillows but no courtesy package of toothpaste toothbrush and bed socks normally provided by the airlines on these long hauls. My sister-in-law who was traveling with us asked the air hostess why there was no pouch and had got the reply that the airline was economising. Economising! I was glad we got some food and was relieved to see that I had my own private mini screen to watch movies on – the flight would not be so boring after all. The journey was a comfy one though a bit squishy. Lean forward and you bumped into the headrest of the seat ahead of you, lean back and you bumped into the knees of the person sitting behind. Was Lufthansa economizing on space as well? How would we manage to open out the little tables fitted into the back of the seat ahead of us? our visit, and previous visits - got our passports stamped. Next was baggage collection and customs and we were finally out, and received by my son and daughter-in-law. And soon we were winging our way home to meet the newest member of the family, granddaughter Samyukta. That is her in her stroller on the waterfront in Jersey city, with New York across the Hudson. 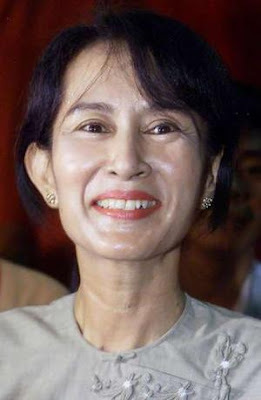 On a global level people are protesting against the incarceration of Aung San Suu Kyi, icon for decmocracy and political freedom, and calling for her release. The festive season is rolling on colourfully. 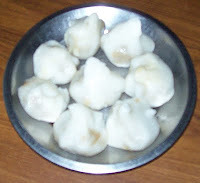 Sri Vinayaka Chathurthi, with its modhakams (the little sweet kozhakattais that Ganesa is so fond of - see picture) and week long concerts at temples went by and now there is a little gap before the next festival comes along - Navarathri. 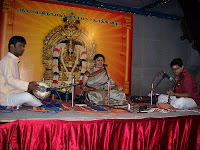 It is the big one, lasting nine days, and culminating in Saraswathi Pooja and Vidyaramabam. There is a pantheon of Gods to worship all round the year, and nothing delights our hearts as much as the poojas and the celebrations associated with them. 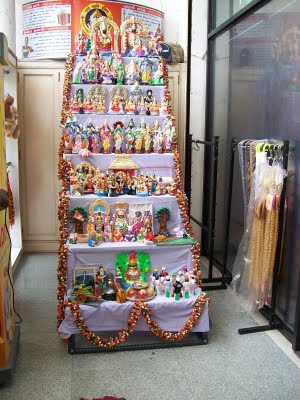 Navarathri means the ‘kolu’, the arrangement and display of multi-coloured dolls on steps. The pavements of North Mada Street in Mylapore are once again full of the lovely dolls. We are packing our bags to visit our new granddaughter next week, and I thought I might miss seeing the ‘kolu’ which begins only after we leave. But there was a pleasant surprise waiting for me when I went to Giri Trading Agency, a storehouse of stuff dealing with Indian culture and tradition, near Sri Kapali Temple. They had this lovely kolu right at the entrance with brand new dolls. And I was delighted to see it. Inside, I was looking for a particular CD – Hindi film songs of Yesudas – and though there were many albums he had released, there were none there that day. Just my luck, I thought, and decided to make tracks to other places to hunt for them. Though I had no desire to trudge in the heat to various shops to look for what I wanted - September has been unusually hot this year, and we are sweltering. An energetic and enthusiastic salesgirl asked me if I was willing to look at the kiosk. I looked at her blankly, and she explained how the kiosk was basically a library of all the songs (with copyright) and I could choose what I wanted and they would be recorded on a CD or on MP3 format. I was quite intrigued but was willing to try. I learnt that is it is called a digital recording kiosk, and has been around for a couple of years. Strangely, not having felt the need for any songs that were not on discs, I had not really bothered to check them out. The kiosk has a touch screen keyboard. 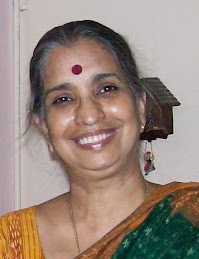 She typed in the name Yesudas, and there was a list of his albums. I could now choose the songs I wanted. This was neat. The procedure did not take long at all, and I had with me the best of Yesudas’s Hindi songs. – and a new experience. All those years ago, when I was a student in Lady Shri Ram College (1964 to 66), I had no idea that one of my contemporaries was going to be an international figure, and dominate the world stage in a quiet way. Aung San Suu Kyi, whom I just saw from afar - one of the foreign students, is what my reaction must have been. She was my senior, and I was a Literature major, while she did Political Science, I think. There was nothing to show what the future held in store for her. I don't even remember noticing her specially, but the spark must have been there even then. One really has no idea of the strength of mind that is required to face such challenges as she has. God bless her, and protect her. Today our college is showing support to this champion in various ways, and mounting a campaign to free her.